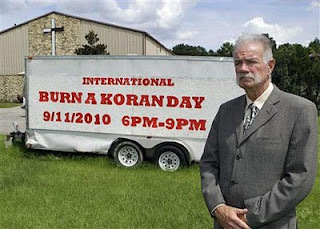 Ten points to consider about the "9/11 Burn a Qur'an Day"
MIND SOUP: For weeks now, a minute church by the name of "Dove World Outreach Center" in Gainesville, Florida, has been advertising for an event it calls "International Burn a Qur'an Day". Pastor Terry Jones is insisting to hold this "event" on September the 11th "to honor those killed in the 2001 terrorist attacks on New York and Washington." He says the burning of the Qur'an will "send a message to violent Islamic extremists like al-Qaida, which carried out the attacks against the United States." The second day of Eid el-Fitr falls this year on the same day. As many world leaders and institutions, including the Vatican, US President Barack Obama, Secretary of State Hillary Clinton and others, have denounced this act, this pastor is insisting on carrying out this event. This is as much facts as I am willing to give about this issue. Below in ten points is my opinionated response. Forth, I (and most of the sane people) don't see how burning a book would honor the victims of 9/11. Would it bring them back? Would it bring peace to their families? Would it pay their children's tuition? No. It will probably cause them more humiliation and uncomfortableness than you think. Fifth, the pastor should look at what he "beloved" country is doing in other countries. Making up wars to enter countries and steal their oil, forcing countries to stop their scientific advancements under the typical alibi of "weapons of mass destruction" and stealing the resources of poor countries whose population doesn't even have food to eat or clean water to drink, that's angel-work isn't it? That's not terrorism in any way. Let him look at what his country's soldiers did in Iraq. They went in, messed up the place and killed hundreds of thousands of civilians, children, elderly, women. Look how they started a civil war there and now casually left after they have claimed all the oil resources they need, and after destroying all the infrastructure that the country desperately need. Let him look at Afghanistan. Let him look at Palestine. Let him look at all the countries the US is sucking dry. If he's going to burn the Qur'an for 9/11, then every day should be "burn the bible" day in these countries. Sixth, I don't even consider this person a religious figure. I would call him a clown, but I would rather not, because it will stir some religious conflicts that I don't want to go into.I'm just calling him "pastor" for reference. Consequently, I would like to ask him: Does your religion tell you to burn the Qur'an? Did Jesus tell you to do that? Show me where it says that in the bible. I wonder if you are really a pastor: even the Vatican has denounced you. I sure hope that none of God's followers take in to your footsteps. Your bible specifically states: "Love your enemies and pray for those who persecute you," (Matt. 5:44). I don't see how your applying that Mr. Pastor! It's not that you're only letting your own church down, you're making Christianity as a whole look bad. Seventh, this stupid purpose of this act is merely seeking attention, seeking 15 minutes of fame. Oh look at him, he's defending out country by burning the Qur'an. He's standing up to those Muslims. Geez! Does the media even focus on things that matter? I don't know why this person is getting a lot of media coverage. Stupid media! Show what the Americans are doing in Iraq, Palestine and Afghanistan. You think the incidents of Abu Ghraib prison was bad, go see for yourselves! Eighth, these 15 minutes of fame may cause the US a lot of trouble. If he thinks that these extremists that he is targeting will not retaliate, boy is he wrong. I sure hope they bomb his little church to show him, just as Americans and Israelis (who are not called extremists -- no!) bomb and attack mosques every week. Ninth, none of the true Muslims support the acts of 9/11. The actually condemn them. Islam is more about peace than any religion. By this measly little event, the US will be losing the support of hundreds of thousands of Muslims in the US, and millions (maybe a billion) around the world. Does he really want to start a new war because of his ignorance? Perhaps the bigger question is: Will the US administration even allow this to happen? Tenth, both the first and fourteenth amendments to the United States Constitution guarantees freedom of religion. Doesn't this act break these laws? Shouldn't he go to jail for this? Or will he be left unpunished because he is a religious figure? I don't know if he realizes this, but the whole world is against him, even the vast majority of the people from his own religion. Even the Jews, who are known to be the most hateful to Muslims, are against him! I would just like to see him emerge as a fool on that day, and may God ("Allah") smack him with a lightning bolt that burns his hair off his head (in irony). 2. I don't think that you should say that you hope people burn down his church because ignorant people cannot help themselves and retaliating with violence would only worsen the case for all Muslims. I know you didn't mean it literally, but still. 3. The Klu Klux Klan is a Christian group, and yet black people don't burn the Bible. (Something that I will honestly never understand). It is truly ignorant for people to base one impression of an entire religion on one small, tiny group of ignorant, uneducated, misinformed extremists.